An Eating Disorder such as Anorexia Nervosa or Bulimia Nervosa has many physiological affects on your body including affecting your oral health. Emma's Story is about how one person was able to recover from Bulimia Nervosa and, with the help of her Dentist, look after her oral health. The gums may become reddened, inflamed, or develop ulcers. Decay = holes in teeth. 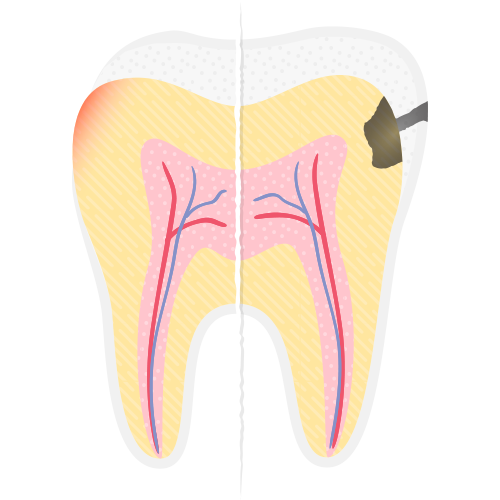 Erosion = thinning of the outer tooth surface, cause by acids from either your stomach (if you are vomiting) or from acidic foods and drinks. Periodontal Disease - you may be at increased risk of gum disease. Decreased amount of saliva causing a feeling of ‘dry mouth’. Sensitivity (from both decay and erosion) especially with cold or sweet foods/drinks. Episodes of pain (from decay). Burning sensations or discomfort of the mucosa. Changes in the appearance of the teeth can vary, but it can range from teeth starting to look very shiny, to small chips appearing on the edges of the front teeth, to teeth turning chalky or yellowish. Thinning of the outer tooth surface caused by acids from either your stomach (if vomiting) or from some types of food/drink. Bacteria use sugars to make decay or "holes" develop in teeth. Prevention of damage - After vomiting, rub some fluoride toothpaste on teeth with a finger, or use a fluoride mouthrinse. The fluoride will help strengthen the teeth against erosion. Eating Disorders affect more than just your oral health, to find out more about the signs and symptoms and the different types of eating disorders that exist, go to the National Eating Disorders Collaboration website. In Emma's Story, our character talks about her experiences dealing with Bulimia. To find out more about Bulimia, the National Eating Disorders Collaboration website provides a useful facts sheet about Bulimia Nervosa, its signs and symptoms, as well as how to get help. Anorexia Nervosa doesn't just affect teenage girls. In this fact sheet from the National Eating Disorders Collaboration, the signs and symptoms of this illness, the associated risks and where you can get further assistance are clearly explained. The warning signs of an Eating Disorder aren't just related to your oral health, there are various physical, psychological and behavioural warning signs that can signal the onset or the presence of an eating disorder. The National Eating Disorder Collaboration website provides more information about detecting the warning signals and seeking help. If you or anyone close to you might be suffering from an Eating Disorder, The Butterfly Foundation provides support for Australians who suffer from eating disorders and negative body issues and their carers. The Foundation encourages hope and help seeking through education and awareness of this disease.